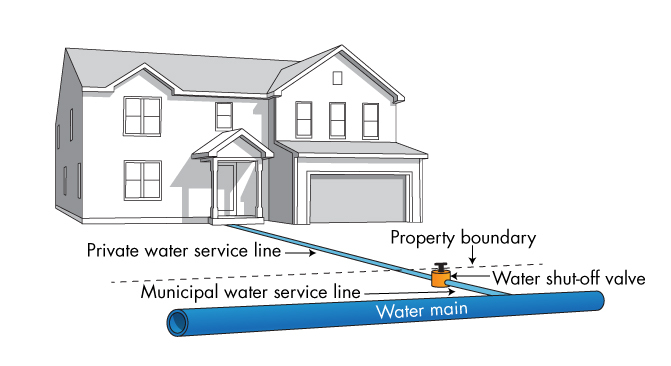 A water service is defined as the piping that connects a property or building to a municipal water main. A typical water service consists of municipally-owned piping (municipal water service line) and privately owned piping (private water service line). The pipe from the water main connection to the property line is owned by the municipality. The curb stop water shut-off valve, which is typically located at the property line is considered part of the municipally-owned piping. All piping located on private property, excepting the municipally-owned water meter, is owned by the property owner. We consider any water service buried at less than 1.65 metres deep to be at risk of freezing. You can estimate the depth of your private water service by measuring from where the water service enters your home up to the ground surface. and privately owned piping (private water service line).